Little, Brown Books for Young Readers, 9780316273565, 44pp. 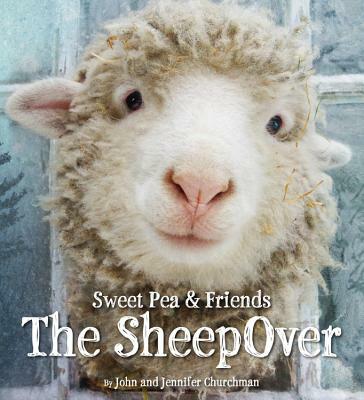 One cold winter night, Sweet Pea the orphan lamb becomes very sick. Everyone in the farmyard is worried about her! Under the watchful care of Farmer John, Laddie the sheepdog, and Dr. Alison the mobile veterinarian, she slowly recovers. Dr. Alison tells Sweet Pea she can have a sleepover to celebrate as soon as she is well again. When the day finally comes, her closest friends Sunny, Prem, and Violet join her in the greenhouse for a fun and imaginative "SheepOver" celebration. This charming story of caring and friendship by farm owners John and Jennifer Churchman, brought to life with John's entrancing photo-illustrations, will enchant readers young and old. In the words of one of her many fans, "Sweet Pea brings a calming, authentic joy to my life that makes me laugh, cry and gives me hope that all is well in the world. . . . Everyone needs a little Sweet Pea in their lives!" John Churchman is an artist, photographer and farmer, bringing stories to life with his enchanting photo-illustrations. Jennifer Churchman is a multimedia artist and business consultant, and has loved telling stories all her life. John and Jennifer bring their talents together to give voice to the stories of all the animals that surround them and add boundless enjoyment to their lives. They have made their home on a small farm in the beautiful countryside of Essex, Vermont, with their daughter Gabrielle. The SheepOver is their first book. They also created Brave Little Finn, A Farm for Maisie, Alpaca Lunch, and The Easter Surprise.